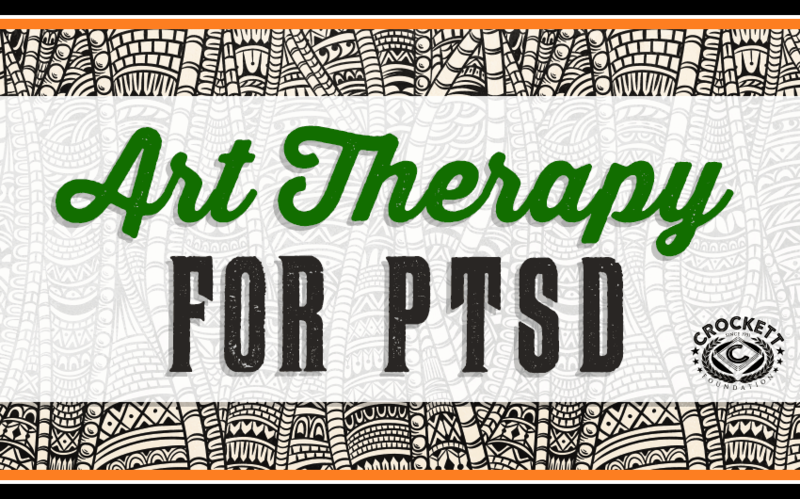 Art Therapy for PTSD | Crockett Foundation - Tag In & Help Out! Art therapy could be playing musical instruments, participating in activities where you make things such as sculpture and painting, writing words such as songs, and other forms of creativity. A lot of people think of painting when they hear the word ‘art’. Add the word ‘therapy’ and some people can’t picture it in their minds at all. Emotionally therapeutic and also physically calming – even when simply done on your own. Physically therapeutic when people make art with their hands to improve their fine-motor skills when they’ve had injuries – as with Veterans with Traumatic Brain Injury (TBI) from experiences in combat. Psychologically therapeutic when it includes expressive activities. For example, creating a mask to express various parts of what’s actually going on inside one’s own physical head and in our minds behind the image we present to the world in our real faces. This multi-media mask is by Maria Salazar, Marine Veteran (https://m.facebook.com/ofArtnSoul/). A good number of Veterans charities feature art therapy. The Crockett Foundation finds some of the best small organizations that do that and focuses on supporting their missions. Check out their mission as a Veteran charity here https://crockettfoundation.com/. THIS Marine Veteran USES FINE DETAILS IN watercolor painting to recover from traumatic brain injury. In a very casual, imperfect form of art, doodling can be therapeutic too. In fact, some people actually think better – solve problems better – when they doodle in meetings. For me, I began doodling and it turned into a real art form for me during a time when I was exhausted – on vacation from being totally burnt out from years of office work –. Here’s a sample of my own artwork that began with doodling. I simply began drawing one shape and then another, filling in these ‘morsels of color’ on 8×10” pieces of watercolor paper. The colors are mesmerizing. It was undeniably relaxing to bring my world down from the vast demands of the work world and just focus on small patches of space on paper. Then the drawings got bigger, and I developed my own style. I realized the whole process was actually meditative: it was therapeutic and rejuvenating to design a piece of art and bring it to fruition in bright colors on heavy, textured paper that felt good to the touch. As an artist with a great interest in Veterans arts, I met Veteran artist Barbara Barnett – and I love her style. Barbara is living with Post Traumatic Stress Disorder and she finds painting these women to be very therapeutic for her own situation. Barbara’s a Vietnam Veteran with PTSD who has developed an amazing series of paintings she calls Women Warriors. Music therapy was healing for AIR FORCE VETERAN Chris SMITH – it rehabilitated him. Playing music can be art therapy too. Here’s a great video highlighting Chris, who found the music therapy program at the Chicago area Veterans Administration hospital to be life altering. It helped him enjoy life and deal with complications and anxiety associated with the loss of his eyesight. To donate to the Crockett Foundation and help Veterans charities that focus on art therapy visit the Crockett Foundation donation page. After this post, check out our post on Animal Assisted Therapy for Post Traumatic Stress Disorder (PTSD).